Getting a good balance in your horses training can be difficult. Things that are perceived tricky by either you or your horse are often glossed over – and one the most neglected gait is the Canter. Below are 5 simple exercises to help you and your horse’s canter, from getting more engagement to improving the transitions. Walk to canter. In principal a very easy thing to do - get a nice active, forward walk and then slide the outside leg back, inside leg on the girth and canter! But in reality it is a much harder exercise, with the walk turning into that infuriating jog-trot or becoming lateral – or even your horse feeling the aid and quite happily hopping into trot. When you start this exercise expect it to start off as a progressive transition, especially with a young or inexperienced horse, with a few strides of trot before going into canter. If this is the case, then you want to stay sat in the trot apply in the canter aid until the horse canters, if there are more than 2-3 strides of trot before the canter then you may benefit for giving the horse in question a tap with a whip (ideally a schooling whip so that you don’t have to adjust your grip on the reins). The walk should feel purposeful but not rushed, before you ask for the canter you want to ask for a slightly collected walk, with a half halt but keeping the leg on to prevent a loss of energy. After a few repetitions of the transition you should get a much more fluid walk to canter, without the trot strides. A good transition should feel powerful and you should feel the hind-legs really step under and the forehand lift. This will help the horse engage his back legs in the canter and build up strength through the hindquarters. This exercise is great for getting the horse responding to the aids, and really focussing on what you are doing – which means the riding has to be correct. We are going to assume you are starting on the right rein but it really doesn’t matter which rein you start on. To start with you want to be in right canter on a 20-meter circle, preferably a nice balanced canter with inside bend – but you certainly do not want a rushed (fast or flat) canter. This exercise works best in a 20X40-meter arena, but any space that is longer than 40-meters is fine. As you approach the centre line at X you want to come back to trot for 2-3 strides and change the rein onto the other rein - keeping balanced and changing the bend if you can; if this takes more than 2-3 strides then fine, you can ask for trot earlier and the canter later, but you must keep the horse balanced. Then asking for left canter and riding a left canter circle of 20-meters. This quick change of leg will get the horse really listening to your leg aids and using the hind-quarters to push through the upward transitions. If your horse starts anticipating the change of leg you can stay on the same rein riding canter-trot-canter transitions to get the horse paying attention to the outside leg coming back as well as helping you with the bend on the circle. This exercise is really good for horses who like to back off in the canter, and who anticipate the downward transition back to trot. 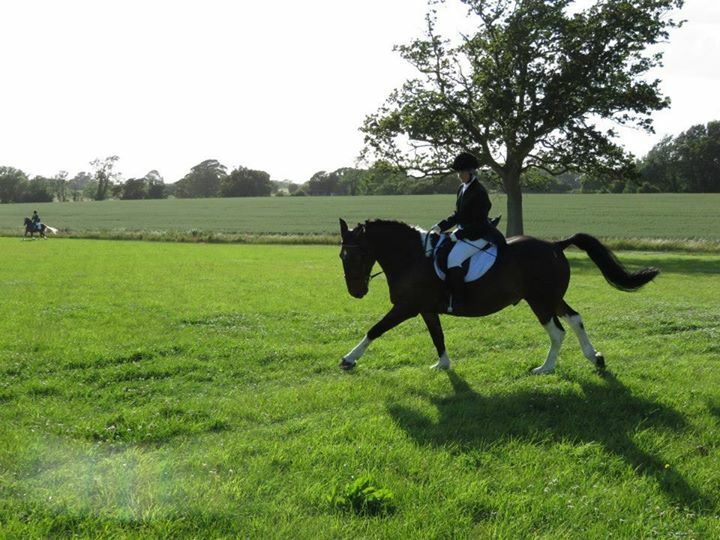 Start in a working canter around the arena, apply more leg aid to your horse, encouraging a faster/longer canter. Start off accepting any forward change in the canter, and then start to use a half halt as your leg is applied. This should encourage the horse to lengthen the stride instead of just speed up. Repeat this a few times - adding in some 20-meter circles to give some variation on the exercise. You should feel your horse’s canter become more uphill and less likely to back off to the trot. A good medium canter should have the same rhythm as the working canter but just be longer striding. This is a bit like the figure of eight, it works on getting your horse listening to your aids, but it also helps keep your horse using his legs and keeping impulsion. Have in your head a set number of strides (5-10 works best I find) and ride upward and downward transitions to and from the canter, only staying in canter that number of strides. This is very helpful as it gives the rider an aim for the transitions. You can also use markers in the arena to ride the exercise to make it a bit easier. Be strict with yourself as well, if your horse starts trying to break into trot keep the canter longer and start varying the length of the canter. This really is a simple exercise, although a lot easier with someone on the ground to assist you. Lay out 3-5 poles in a straight line with 3 yards in between them (length of an average canter stride for a 15.2hh horse). Firstly trot through them, getting a feel of the horse over them, especially for the greener horses and ponies. Do not worry if they get knocked as you go over them, just make sure they are reset each time (cue person on the ground), and before you canter over them get the canter moving forward and with good impulsion. You can use some circles or transitions to help the hind legs come under a little more. As you come over the poles keep the leg aids on to push through them and deter them falling back to trot over them. The poles should encourage a more open and even canter, which should be maintained after the poles with the inside leg. There is a good chance that your horse will not be able to maintain this new canter for a period of time if it is the first time using this sort of exercise so once completed successfully a 2-5 times each rein it is wise to move on. If the horse kicks the poles out, they MUST be reset before coming over them again, or they may interfere with the horses canter rather than help. If there is consistent knocking of the poles there is a good chance that the horse is on the forehand and rushing, use half halts and shorten the periods of canter to assist this. 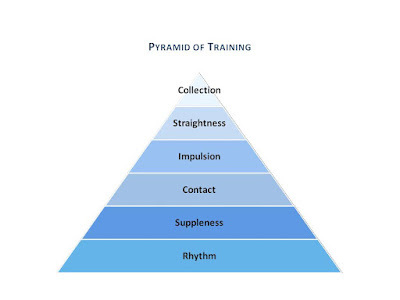 The effectiveness of these exercises will vary depending on your horse’s level of training, age, breed/type and experience. They can all be modified to make them harder or easier for the horse you are riding/training. It will take time, patience and accurate training records to help you improve the quality of your horse’s canter.